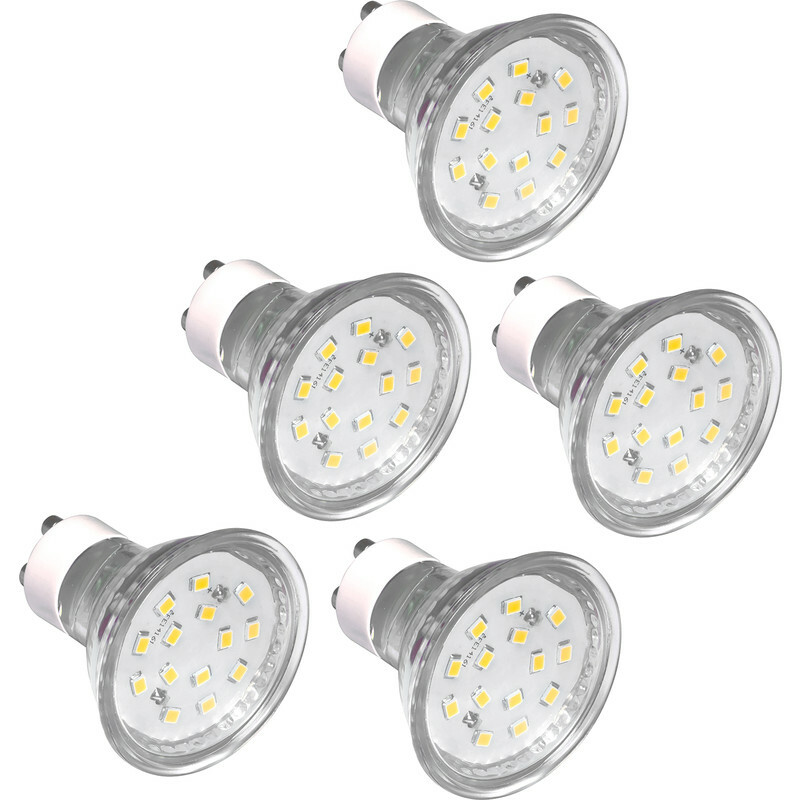 LED GU10 Glass Lamp 2.5W Warm White 250lm (5 Pack) is rated 4.8 out of 5 by 58. Rated 5 out of 5 by Pendragon from Light of my life Excellent value, efficient and cost effective. Rated 5 out of 5 by CJ design from LED Bulbs excellent! I have recently bought this product they are very bright and reliable compared to old type Gu10 bulbs I have bought in past. Rated 5 out of 5 by Slow and steady from Nice white light for my bathroom I've found LED bulbs a little hit and miss ... but these are good .. A very white clinical light ... not at all warm or cozy! Looks great in my bathroom! Rated 5 out of 5 by JayK from Excellent GU10 Bulbs Nice compact size. We have a LOT of spotlights throughout the house, and some are quite a tight fit with some of the larger 'fuller' bulb bodies. These are reasonably low profile and a little smaller than a lot of the plastic bulbs. Very bright for 2.5w. Also use them in our soffit/external lighting. Have about 100 of these, and some for over a year now; not a single failure. Rated 4 out of 5 by Royboy2 from Nice lamps and ideal for a 3 lamp kitchen fitting I bought these for my daughters kitchen/diner. It has two ceiling fittings each containing three lamps and she seems pleased with them. Rated 5 out of 5 by Lilli from Brilliant Wish I’d bought these years ago. My kitchen is dark on a good day, now it’s daylight at night. Rated 5 out of 5 by Kentishman from Good value, nice white light and quite bright Only 2.5 watts per lamp but quite bright and good light distribution over wide angle. Just the job for areas where above average lighting is needed.